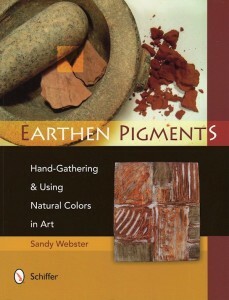 Sandy Webster’s book Earthen Pigments: Hand-Gathering and Using Natural Colors in Art, Schiffer Publishing is available in book stores and Amazon.com. 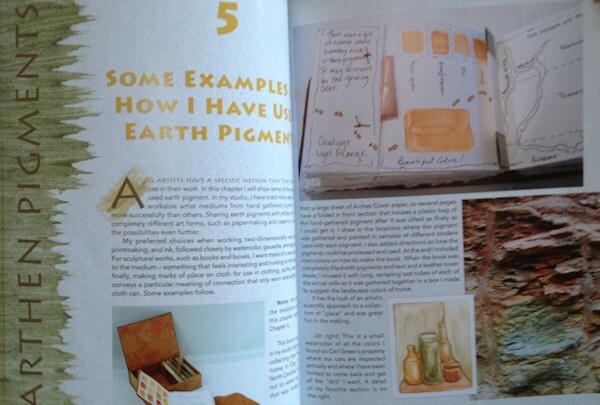 Sandy invites the reader to learn the many ways that natural earth pigments can be gathered and processed into several usable artist mediums. The book is filled with color photographs of locations where Sandy has found the pigments she could use on site or in her studio to fix “place” onto her artworks. She begins with a brief history of earthen pigments and the minerals that influence their color. She shares her experiences in locating and gathering the soils that contain that color. Returning to the studio the readers are introduced to a variety of ways to reduce the collected soils to the purest pigment possible which is then labeled and stored for later use. Included are tips on how these processes can be completed while traveling. There are several color photographs of the author’s work using hand-gathered pigments followed by the recipes she uses to make her artist mediums. These include water based paints such as gouache, water colors, pastels, crayons, casein solutions, egg tempera, printmaking inks and even spun papers that have saturated with color. The gallery section includes natural earth colored artwork from the author’s own collection and a selection of ways other artists are using natural pigments.